Shtrughna "Kumar" Ghildial - meherbabatravels jimdo page! 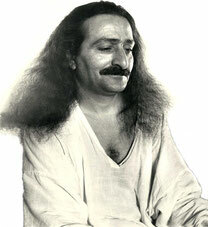 Meher Baba always called him "Kumar". 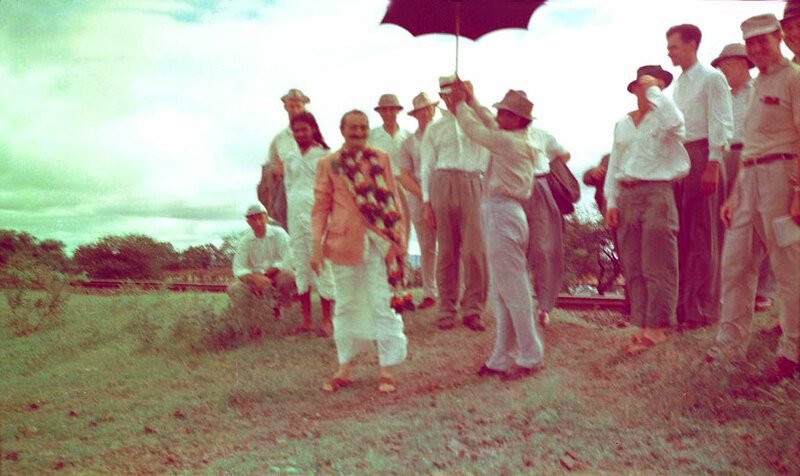 Kumar holding the umbrella for Meher Baba with Baidul looking on. 1954 : Kumar holding the umbrella for Meher Baba at Meherabad with the Western men who stayed with Baba for 3 weeks. 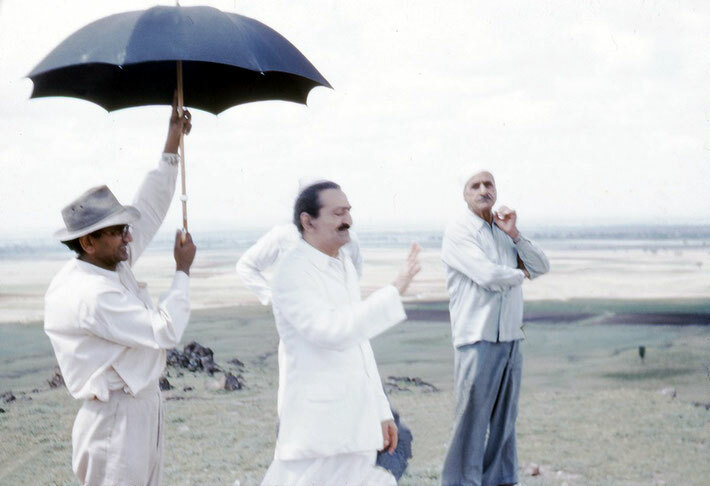 In the 1930's, before I knew of Meher Baba, I was totally devoted to politics and played an active part as a revolutionary: trying to free India, my motherland. The British, who were then ruling over India, twice put me in jail. Altogether I was imprisoned for over ten years because of my political activities. The second time I was put in jail was in 1940. This time I did not have a trial and was simply incarcerated as a "state prisoner," with no term set to my imprisonment. After five years, I learned that some of the leaders of the revolutionary movement were being released. As these men were considered much more dangerous by the government than I, who was not a big leader, I began to expect that I too would be released soon. But, instead of being set free, I was shifted to a deep underground cellar from which prisoners were not generally released, and I knew this was the end of the line for me. I thought of my lovely young wife, Subhadra, and my widowed mother whom I loved dearly, having to till our acres of farmland, waiting patiently and lovingly for me to come home — but I knew now that I would never see them again. If I could only get out, I thought, I would even give up my revolutionary activities. I had really grown tired of being in jail and began to crave freedom. But I knew it was no use thinking in those terms for I would never get out and my loved ones would never even know what had happened to me. I was very depressed. Then one day, I suddenly sat up with a jerk, "God, only God, if He exists, can help me!" The thought just came to me that the only way out of jail was to ask God to help me. 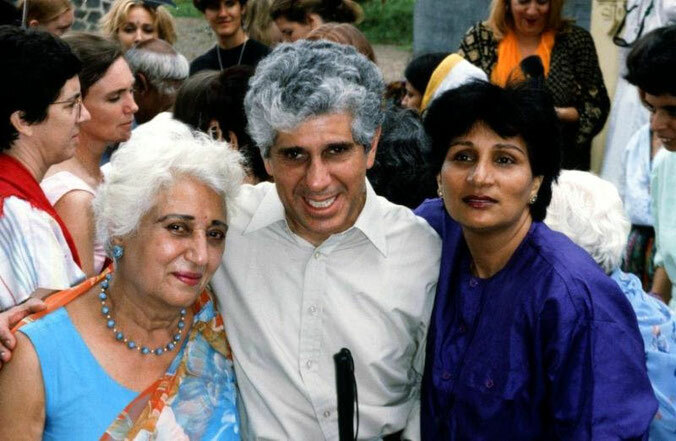 I had been brought up in a spiritual environment at home, but after joining the revolutionary party and spending a long time in politics, I had become an agnostic. But that night, when the other prisoners were asleep, I prepared myself to request God to release me. I either didn't know, or by now had forgotten, how to address God so I simply said, "Mr. God, if there is any God, I request You, please get me released from this jail." But simultaneously with this request came the thought to my mind that every punishment and pain is man's own earnings according to his deeds; if jail was my own earning, then why should God interfere? Yet right on the heels of this thought came another — that if I promised to accept any binding outside of jail, then this would serve the purpose. I felt I had found the solution. So I began my request again, "Mr. God, please get me released from this jail and in exchange I promise to abide by and obey any binding whatsoever you impose upon me outside this jail." And while I was making this promise to God, I began to feel strongly that God was going to accept my bargain. And then another thought entered my mind. How will I know if my bargain has been accepted by God? Even if I am released, what proof will I have that it was God's doing? So I added, "Please God, if You have accepted my promise and bargain, then get me released early in the morning, as soon as the prison gates are opened. If I am released any other time, the following day, tomorrow morning, I will take it that my release was all by chance and not Your doing." Actually, it was an impossibility for me to be released as soon as the prison gates opened. For they opened at dawn, but the superintendent, who would have to sign my release papers, didn't arrive until at least ten in the morning. Despite this, after so much conversation with God, I became so sure of my being released early in the morning that I started to pack my belongings in my two large trunks. I spent the whole night in praying, requesting, promising, bargaining and packing. 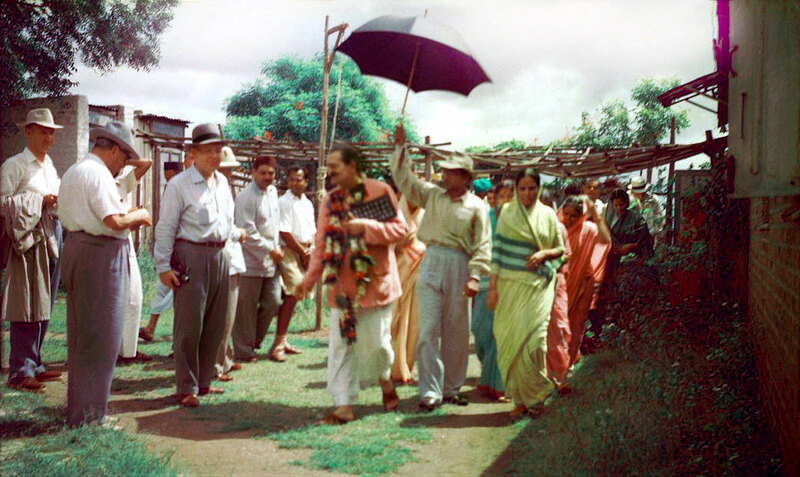 In 1954, about eight years after my release from prison, Baba called me to Satara in Maharashtra to spend one week with Him. But once I arrived, Baba kept me there for almost one year. He further imposed upon me many restrictions and bindings such as to have no correspondence with anyone, never to step out of the premises unless I was to accompany Baba as His umbrella bearer, etc. Several months passed like this and my clothes were almost in rags and I had grown a beard. One day it occurred to me that I had so many restrictions on me, it was as if I were in prison! I became a little upset; I had spent so many years in jail and now it seemed my life hadn't changed at all. 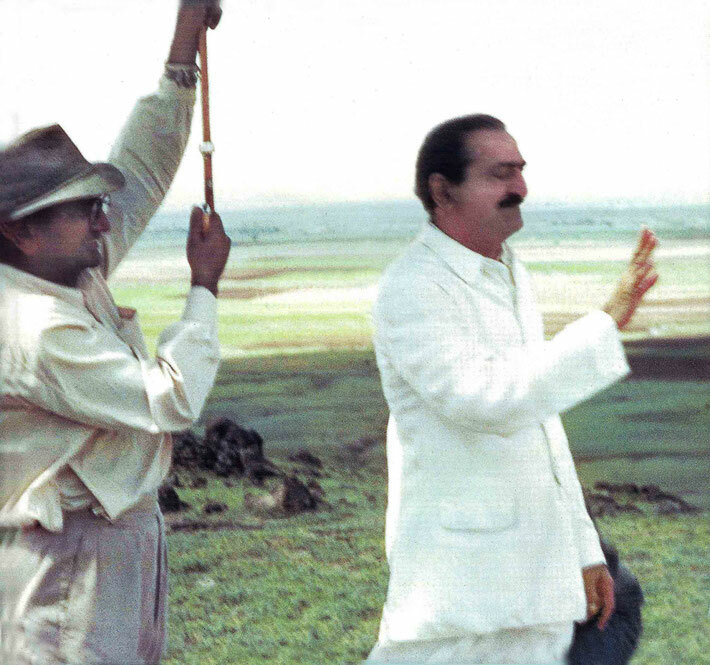 But that very day Baba took me along with Him in His car while He went for mast work. On the way, out of the blue, Baba asked me, "How long were you in prison?" Without thinking about why Baba was asking me such a strange question, I spontaneously replied, "More than ten years on two occasions ... on the second occasion ... I was put in prison for an indefinite period." "How did you get released then?" Baba asked, and all of a sudden it all came back to me. I had completely forgotten my bargain with God, but now I remembered everything — my request, my bargain and my promise. I said, "I requested God to release me." Baba gestured, "Only requested? Didn't you say something more to God?" I looked up into Baba's eyes. He was smiling. I said, "Yes, Baba. I promised also." "In what manner did you request God, and what was your promise to Him?" I explained that I didn't know how to address God so I had begun my request by saying, "Mr. God, if there is any God, I request You, please get me released from this jail." And, in return for this, I had promised to abide by any binding whatsoever imposed upon me outside of jail. All along Baba had been smiling. But now, suddenly He became very serious. He took my right hand and placed it upon His and made me repeat the promise three times. "Don't break this promise," He gestured. "I am God; I am that 'Mr. God' to whom you made the promise. I have kept My side of the bargain; now keep yours." Something like an electrical current passed through my body and I began to perspire till I was completely soaked. Baba then caressed me lovingly. Up to that time I had served Baba and loved Baba as a Great Soul, but now I knew with a conviction beyond question that I had found God, the Highest of the High. Katie Irani with Dara and Amrit Irani.